Highlights from Jason Roy's blistering 91 off 53 balls to fire the Delhi Daredevils to a first win of IPL 11. 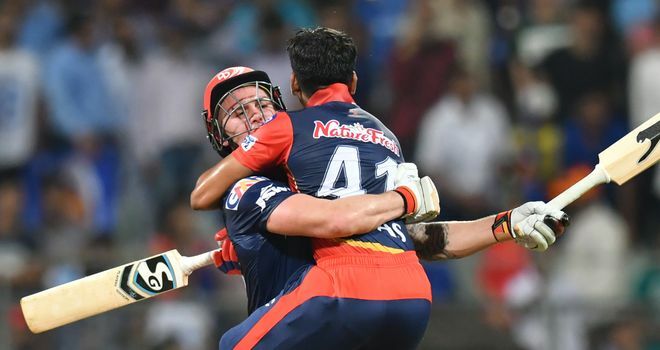 Jason Roy smashed a blistering 91 off 53 balls in his first game of IPL 11, guiding Delhi Daredevils to their first win as they successfully chased down Mumbai Indians' 195. Roy blasted six fours and six sixes - including two monster maximums of 95 and 96 metres - and hit the winning runs off the final ball. However, Roy very nearly undid all of his fine work when, with 11 needed from the final over, he followed up 10 runs off the first two deliveries with three dot balls - wildly swinging and missing at Mustafizur Rahman - before finally, and somewhat unconvincingly, skewing the winning run away over extra cover off a thick outside edge. Defending champions Mumbai have now lost all three of their opening games of the 2018 tournament. This one will particularly sting though, having failed to make the most of a sensational start with the bat, managing a score of only 194-7 after having fired a franchise-record 84 runs from the six-over powerplay. 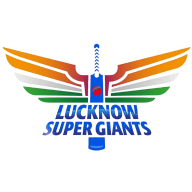 The Indians were put into bat by Daredevils skipper Gautam Gambhir and promptly got off to a flier, with tournament top-scorer Suryakumar Yadav (59 off 32) and Evin Lewis (48 off 28) sharing in a century opening stand. As impressive as the pair were - Lewis, in particular, firing four sixes - the partnership was as much down to some incredibly sloppy work from Delhi's bowlers, and in the field. It made the change in fortunes for the final 14 overs of the innings all the more remarkable - Rahul Tewatia (2-36) first stemmed the flow of runs with the key wickets of Lewis in the ninth, lobbed to Roy at mid-off, and Yadav lbw in the 11th. 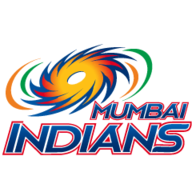 Ishan Kishan came in and smacked 44 off 23 to wrestle back momentum for Mumbai, but a Dan Christian (2-35) double-strike - bowling Kishan and Kieron Pollard - off as many deliveries stopped the innings in its tracks once more. The Indians managed only one boundary, lost three wickets and added only 27 runs in the final four overs. 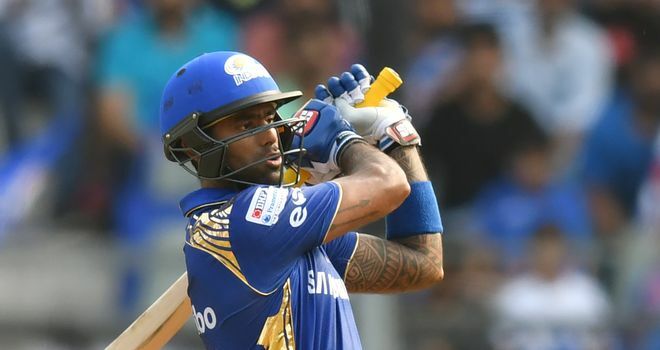 Roy got the Delhi chase off to a dream start, including smiting Akila Dananjaya for a massive 95-metre six over midwicket in the second over. Further maximums arrived, off consecutive balls, in Hardik Pandya's fourth - the second of which, a pull over deep square-leg, bettered his earlier effort by a metre. Given the success Roy was having, it made Gambhir's decision to top-edge an attempted pull at the start of the subsequent over all the more baffling, when only rotating the strike and handing the reins back to Roy was required. Rishabh Pant provided fine support for Roy, striking six fours and two sixes in his 25-ball 47, but he was one of two wickets to fall to Krunal Pandya (2-21) to briefly derail the run-chase - a diving catch from Pollard to remove Pant was bettered by a simply stunning leaping grab by Hardik to account for Glenn Maxwell (13 off 6) soon after. Roy, unperturbed, swatted Krunal for six into the TV replay screen in his next over, while Shreyas Iyer (27no off 20) did his bit, though he was badly dropped by Mustafizur at short third man, on 13. Mustafizur made up, somewhat, for his error by bowling an 18th over that cost only eight runs, while death-bowling maestro Jasprit Bumrah bettered that by conceding only five from the 19th. It left a nervy 11 still needed from the final over. Roy drilled four over extra cover and then flicked six over fine leg to seemingly seal a Delhi win, only to then be deceived by three slower deliveries from Mustafizur. But, the winning run did finally come, off a thick edge off the final ball. Delhi Daredevils won the toss and elected to bowl.